I was on the schedule to see patients yesterday, so I had to catch an early flight to Las Vegas. The gate area was full of people also headed to HIMSS, by virtue of this being the first non-stop flight to Las Vegas for the day. Plenty of logoed backpacks and polo shirts made it easy to pick out people headed to the show. I normally avoid flying on Monday mornings because it’s such a zoo and today was no different, although it was possibly more challenging than normal. The TSA Pre-Check line was as long as I’ve ever seen it and TSA kept routing people out of it into other lines, causing tension and some line-jumping that led to angry words. My Southwest flight had plenty of people trying to save exit row seats despite the no-seat-saving policy, and I thought two passengers were going to come to blows at one point. Fortunately, cooler heads prevailed. Travel seems to losing civility with every trip I take. On this flight, one man yelled at the flight attendant for touching his arm as she passed (his arm was hanging out into the aisle, making it nearly impossible for anyone to get by). Although we were on a nearly new aircraft, the wireless wasn’t working, which I’m sure raised anxiety for people who had planned on doing work during the flight. Regardless, a gentle note to travelers: if you have company logo apparel and luggage tags, you might want to behave accordingly. I made a couple of notes to try to see if some of the less-well-behaved passengers turn up in their respective companies’ booths. There were plenty of in-flight conversations about the need for comfortable shoes and where people were staying – lots of people off the strip and several companies renting houses rather than being in the HIMSS room blocks. The general tone is that HIMSS has become all about the exhibit hall and networking and that the keynote speakers are largely irrelevant. Most of the people who were chatting around me on the flight are from the vendor side of the house and didn’t have opinions about sessions or the educational value of HIMSS because they’ll be stuck manning their booths or doing coffee runs. I was reading some continuing medical education materials during the flight and my seat mate asked whether I was a physician. He was curious as to what I thought about Uber’s new foray into healthcare. I have mixed feelings on the offering, considering that the physicians, hospitals, and care providers are expected to foot the bill. Sure, it’s cheaper than an ambulance and cheaper than noncompliance, but for small practices that are not in risk-sharing arrangements, it’s going to be one more thing to pay for and less likely to happen. These practices are already paying for translation and interpreter services that usually negate any profit they would make from a given visit, so when you throw transportation in the mix, it only works when there is a larger entity at play to absorb the costs. I did note that if patients have the regular Uber app, the visit isn’t billed – it’s not clear however how the drivers will be compensated in that situation. 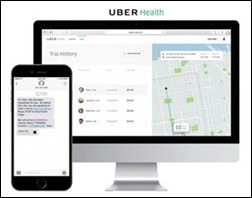 It will take a special group of drivers to care for the Uber Health population, drivers who are aware of the needs of medically complex patients who may have difficulty getting out of the house, who may have accompanying medical equipment, or who may have challenges related to their medical conditions. I assume Uber has this figured out since Uber Health has been tested for more than six months by a group of 100 hospitals and physician offices. Patients can be scheduled by the practice up to 30 days in advance, which certainly can help patients keep their visits. I was interested to see that the Uber tools are “compliant with HIPAA,” which makes me wonder whether name and address are the only PHI elements they’re tracking. There are also liability questions. When we have patients at our practice who require transportation, we provide contact information for various community and commercial services. Our contact sheet has a disclaimer that we are not affiliated with or recommending these services and are simply providing it as a convenience. If the physician office schedules transportation and an accident occurs, do they share the liability? What if an office sends an Uber but an ambulance was really more appropriate? We’ll have to see how things shake out over the coming months. I finally arrived in Las Vegas late morning, and although check-in at my hotel was quick, they didn’t have a room ready for an early arrival. 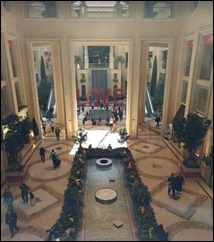 I spent some time tidying up some project plans and people watching at the Palazzo shops before meeting a former colleague for dinner. We hit some of the shops afterwards and then made our way to the opening reception in Hall G. This year’s reception had a Pac-Man theme that I didn’t quite get, although I did get a kick out of seeing the arcade games scattered around the subterranean Hall G. There was a crush of people trying to find the buffet tables that were scattered around the hall, leading to long bar lines and questions about what was being served. Even though there was a map of offerings at the entrance, I never saw half of the options that were listed. Although many booths were fully manned, some were still being set up and still others were totally empty. I’m sure this is the largest influx of people into the basement level for the week, so if you weren’t trying to grab attention, you missed out. 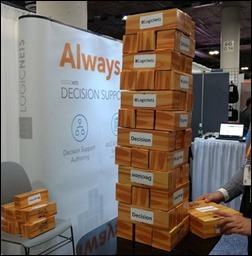 LogicNets was building an oversized Jenga game in its booth. 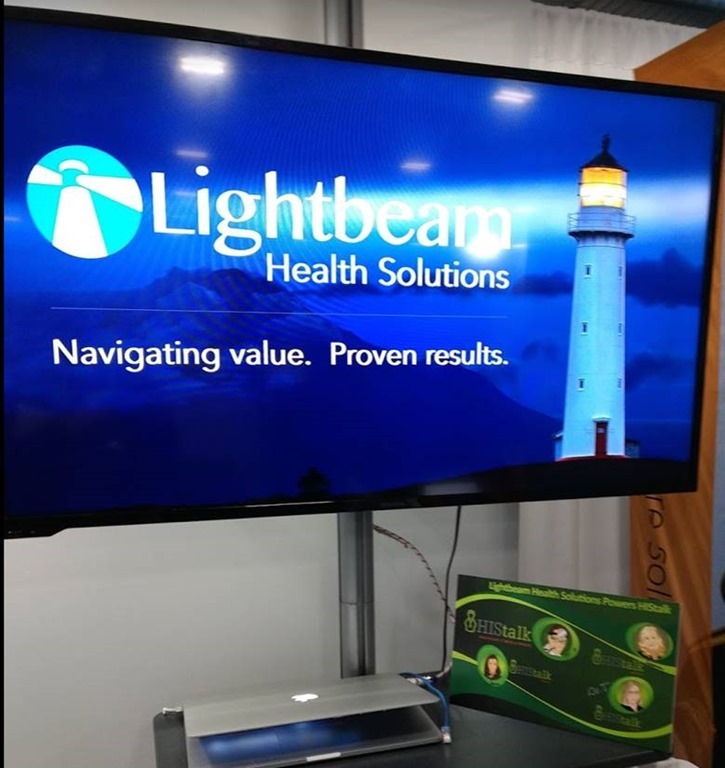 Lightbeam Health Solutions wins my prize for being the first booth I saw that had our sponsor sign proudly displayed. I was pleased to see that the HIStalk booth with its smoking doc is ready to greet attendees tomorrow, just down the aisle from not only the Philippine Trade and Investment Center booth, but also behind the Nihon Cohden America booth, which wins my prize for some of the creepiest imagery. They have a 3-D female figure that has pictures of organs project onto it, I think they’re responsible for a guy who was wandering around with medical tape and electrodes on his head. I tried to get a picture of that, but he got away. I felt sad for the empty “first time exhibitor” booths where perhaps the exhibitors ran out of money before they made it to the show. It looks like there are plenty of things to see in Hall G – I will have to go back and investigate what looked like a large slot car track and also a couple of interesting booths. Optiv is a first-time exhibitor, and although I didn’t have time to stop by to see what it is they do, the booth was well put together and the team seemed to be ready to talk to people. I saw one booth whose tables were covered by leftover buffet trash even though there was staff present, giving it the air of the aftermath of a college party. I closed out the night with my first martini of the year (!) with a friend and am off to bed so I can be well-rested for tomorrow. Who knows what HIMSS Tuesday will bring?